Many gardeners, myself included, cannot wait for spring each year: to get our hands in the soil, the sweet, pungent smell of mulch, and to spot your perennials peeking through the ground. But if you’re looking to add diversity and some natives to your garden we have you covered. 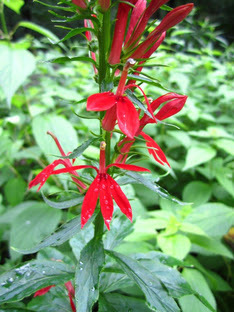 We’ll be offering native perennials for spring, summer and fall. Never tried a native in your garden? Here are few reasons why you should. Native plants are local to our area, which means they are already well adapted to our region’s climate. This means less watering, fertilizing and less replacing of dead plants. Also, because we live in a diverse region, you can find native plants to suit most types of gardens, from damp and shady to sunny and dry, there are many attractive flowers, grasses, shrubs and trees you can choose from. Planting native also helps enrich the environment by providing food and habitat for many species. Local plants have evolved with our local insects, birds, and wildlife and they rely on each other for survival. So check out our natives for sale online, where you can also pre-order (by April 18). Or, stop by to see our wide selection at our one day sale on Saturday, April 30, 2016 from 1-4 p.m. at Long Branch Nature Center. Know someone who would like to receive our e-newsletter? Forward this e-mail to them so they can subscribe online! The link is located at the bottom.